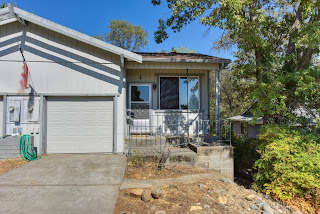 2705 Woodridge Court in Placerville SOLD for $15,000 ABOVE ASKING - GREAT INVESTMENT OPPORTUNITY! Split level, single story 2 bedroom / 2 bath halfplex with attached 1-car garage. Low maintenance front yard. Stone fireplace in living room, eat-in-kitchen with refrigerator, washer, dryer included. Master bedroom suite. Access from kitchen to raised, wrap around rear deck overlooking trees and green space! Current tenant is month-to-month.